White established himself as a top professional in 1981. After losing 8–10 to eventual champion Steve Davis in the first-round of World Championship, White went on to win his first professional titles – the Scottish Masters (defeating Cliff Thorburn in the final) and the Northern Ireland Classic (defeating Davis). The World Championship has provided the theatre for White's greatest disappointments. In 1982, he led Alex Higgins 15–14 in their semi-final, was up 59–0 in the penultimate frame and was a red and colour away from the final. After missing a red with the rest, however, he could only watch as Higgins compiled frame-winning 69 break. Higgins won the deciding frame that followed to reach the final. In 1984 White won the Masters for the only time to date, beating Terry Griffiths 9–5 in the final. He followed this success by reaching his first World Championship final. Trailing Steve Davis 4–12 after the first two sessions, White responded by reducing the deficit to 15–16. He then made an aggressive clearance of 65 to take the score to 16–17, but was unable to build upon a 40-point lead in the following frame, and lost 16–18. White did, however, become a World Doubles Champion later that year when he and Alex Higgins defeated Willie Thorne and Cliff Thorburn 10–2 in the final of the Hofmeister World Doubles. In 1986 White reached his second Masters final, but was defeated by Cliff Thorburn. However he won the Mercantile Credit Classic and also retained the Irish Masters title he won in 1985. White won the Mercantile Classic when he beat Thorburn in the final frame after needing a snooker. Later in the year he overcame veteran Rex Williams 10–6 to win his first Grand Prix title. White's third ranking win – the 1987 British Open – helped him to end the 1986/1987 season as World number 2, behind Steve Davis who defeated him 16–11 in the semi-finals of the 1987 World Championship. Later that year White and Davis contested a memorable UK Championship final which Davis won 16–14. In 1988 he defeated John Campbell, Stephen Hendry and Tony Knowles to reach his fourth World Championship semi-final. He played Terry Griffiths and, trailing 11–13, lost a tied frame on a respotted black. Griffiths went on to reach the final courtesy of a 16–11 win. White did at least manage to consolidate his number-2 world ranking. However the 1988/1989 season was less successful, and White's ranking slipped. 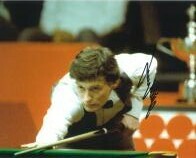 He trailed John Virgo 11–12 in the second-round of the 1989 World Championship and looked beaten when his opponent was on a break of 26 in the following frame. Virgo, however, called a foul on himself and White was able to win 13–12. The reprieve was short-lived as White was soundly beaten 7–13 by eventual finalist John Parrott in the quarter-finals. White avenged this defeat later in the year by beating Parrott 18–9 in the final of the invitational World Matchplay. In 1990 White recorded an 16–14 victory over Steve Davis in the semi-finals of the World Championship. It was Davis's first defeat in the event in 4 years. White subsequently lost his second World Championship final 12–18 to Stephen Hendry. However White beat Hendry 18–9 to retain his World Matchplay title later in the year and this win was followed by a 10–4 victory over Hendry (after leading 9–0) in the final of the 1991 Mercantile Classic. White continued his run of success with victory in the short-lived World Masters, beating Tony Drago 10–6 in the final. Steve James ended Hendry's reign as World Champion in the 1991 World Championship and White in turn defeated James to reach the final. He played John Parrott and was whitewashed in the first session 0–7. Although White managed to close the gap to 7–11, Parrott was able to seal a convincing 18–11 victory. Parrott then overcame White 16–13 to win the UK Championship later in 1991.